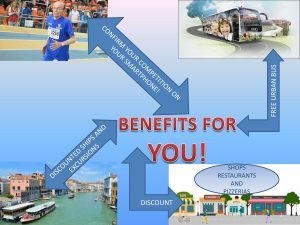 a) – Benefit to confirm your own competition directly on your Smartphone, your Tablet or Pc wherever you are and without having to go personally to the TIC!!. b) – you will be granted extra-urban transport at discounted prices both from the points of arrival to the 3 Resorts and during the whole event for trips between the 3 locations. Urban transport in the areas of Jesolo and Caorle will be completely free, however it will be organized accordingly for the Accommodations we are aware of and that are in our platform!! c) – you will also be granted Discounted Rates for several packages of Touristic excursions to Venice and nearby Touristic Cities and Venues! !